Featuring a revisionist view of history, an element of horror, regret at a romantic opportunity not taken, Robert D. Krzkowski’s fantasy is mostly about the loneliness and melancholy of old age. And who better to pay the part of a quiet man who rises several times to the occasion when only violence is justified than Sam Elliott? As Calvin Barr, this New England resident lives a quiet life with his loyal Golden Retriever Ralph, and is a subject that is in the writer-director’s métier. Though this is Krzykowki’s freshman feature-length movie, we can anticipate the subject matter by noting that his short “Elsie” in 2016 is located in the sleepy town of Campbell Falls, wherein one Ridley Hooper awakens to discover that he must rescue his little sister has been stolen by an army of creepy Shadowmen. 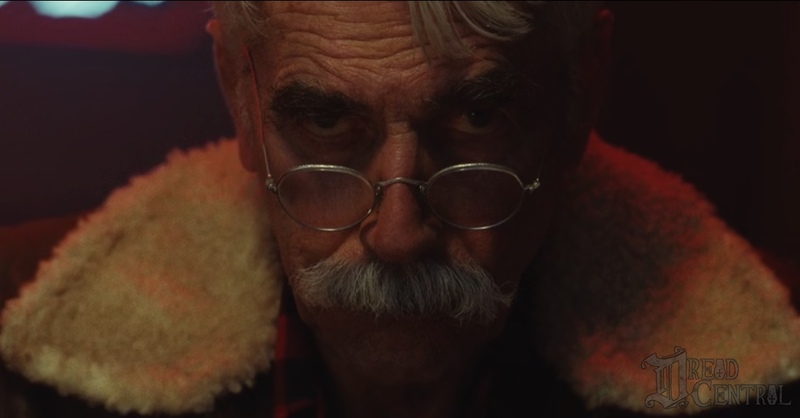 What emerges is a look at Calvin Barr (Sam Elliott), who has memories of his younger days, where he is played by Aidan Turner, a World War 2 hero and American soldier with a gift for languages who dons a Nazi officer’s uniform, worms his way into Hitler’s headquarters, and shoots him in the chest and in the head. Of course we know that Der Fuehrer ended his own life by poison and a self-inflicted gunshot wound, after which his loyal followers destroyed his corpse in limestone. Or do we? According to Krzykowski, the assassination was covered up and it was really Hitler’s number two man who ended his life as the Russians moved in. Using his signature gruff voice and monotone, Elliott appears with a thick head of white hair parted in the middle, his only roommate being Ralph the dog, and for our benefit, Calvin conjures up the past. He is a resounding success as an espionage agent who infiltrates the Nazi war machine, observing two lines of prisoners bound to a train leading to a concentration camp. Though he knows his killing of Hitler is both justified and essential, he has mixed feelings since, after all, he had taken a man’s life. In a more pleasant setting, he dates Maxine (Caitlin FitzGerald), and is about to offer her a diamond ring in an upscale restaurant when the couple are harassed by the parents of one of Maxine’s third-grade students. They profess their love for each other, but nothing has come of it, though events overtake the two leading to Calvin’s loneliness. Now in 1985 the elderly gentleman is still able to fend off an attack by three thugs demanding his wallet and car keys. Knowing Calvin’s reputation in the war and of the way he dispatched the muggers, two agents–one from the FBI, Flag Pin (Ron Livingston), the other, Maple Leaf (Rizwan Manji), from the Royal Canadian Mounted Police, visit him in his cabin begging him to go to the Canadian wilds and destroy Bigfoot (Mark Streger), a monster who is spreading an epidemic that could lead to the end of the world. Calvin is a man of few words and, in fact, he has not kept in communication with his younger brother Ed (Larry Miller), a small-town barber, who offers to give him solace if only he would use him to relieve the stress of Calvin’s loneliness. Since the title of the film already gives away that Calvin kills both monsters, Hitler and Bigfoot, there is no surprise there. Instead the real treat is in Sam Elliott’s performance, a delightfully underplayed execution that is threatened only by Joe Kraemer’s loud, intrusive music. This is the kind of American myth which is however fantastical comes across as strangely believable. And boy, do we need a myth to believe in now!